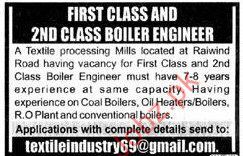 A well reputed textiles Processing Mills looking for First Class Boiler Engineer, Second Class Boiler Engineer. Interested candidate can apply. Candidate must have experience in relevant field. You can apply online at vacancy after registering at http://www.jobz.pk site.